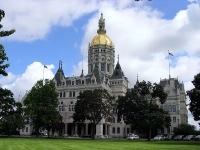 Hartford, the state capital of Connecticut, is often overshadowed by its more prominent neighbours, New York and Boston, or by the more 'touristy' destinations of New England, but the city does attract multitudes of business travellers. It sits at the end of the navigable portion of the Connecticut River, and this waterway has shaped the city's evolution into the 'insurance capital of the world'. Historically, its location made Hartford an important trading centre, and when groups of merchants began to share risks, the Hartford Insurance Company was born. It still operates in Hartford today, along with many of the nation's largest insurance corporations. Despite this reputation for business, Hartford does have a lot to offer those visitors with leisure in mind. Greater Hartford is home to more than 200 cultural, arts and heritage organisations. Hartford Stage, one of many venues for live musical and theatrical productions, has been recognized by the Tony Awards and the OBIEs. During the warm summer months, many outdoor concerts are staged downtown, and various festivals, sporting events and performances are held at the Mortensen Riverfront Plaza throughout the year. The Riverfront has a pristine shoreline and encompasses 148 acres of park grounds with walkways, biking trails and water activities on offer. The state-of-the-art Connecticut Convention Center is also located here. For history buffs, Hartford lives up to its responsibility as one of the oldest cities in the nation. At the State Library, visitors can view the Fundamental Orders adopted in Hartford in 1639, the first document in history to establish government by the consent of the people. A few blocks away, the entertainment district begins west of Main Street, offering visitors no end of dining, pub and club options. Sports fans can revel in University of Connecticut basketball; year after year, the UConn Huskies are contenders in both the National and Big East Championships. We are looking for contributors for our Hartford travel guide. If you are a local, a regular traveller to Hartford or a travel professional with time to contribute and answer occasional forum questions, please contact us.